#V125 1870 schoolmarm's ensemble includes blouse,skirt and apron. Blouse has short puffed sleeves and front buttoned closure. 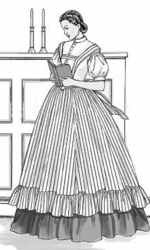 Long full skirt is covered by a tie-on ruffled apron.